The yellow pinto station wagon threw up a cloud of dust as it raced toward the parking lot at the end of the soccer field. His parents were late, he soon learned, because the gas tank sprung a leak in Exeter, New Hampshire. The mechanic recommended Fels Naptha soap as a plug, and off they went, delayed, undeterred, to their son’s summer camp in Maine. 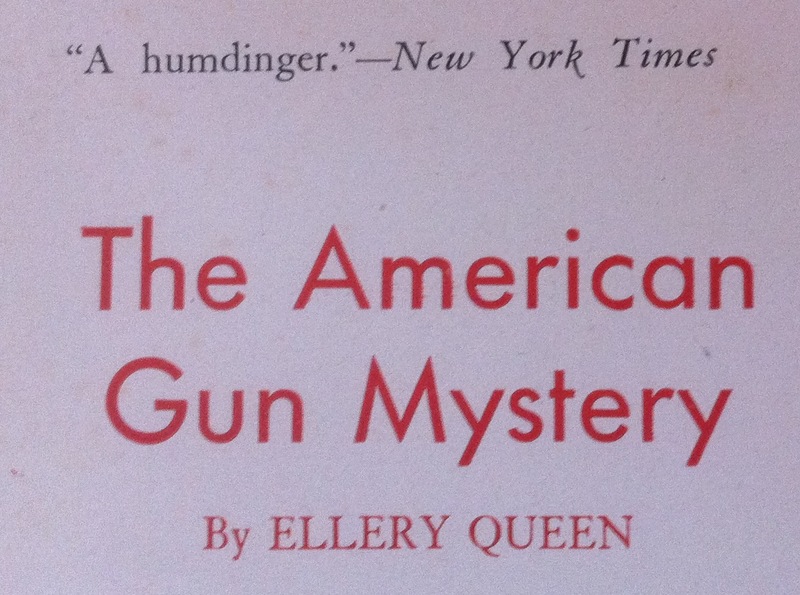 While waiting in Exeter, they visited a used book store where they found a present: a vintage hard cover copy of Ellery Queen’s The American Gun Mystery. It was his (my, of course) first, of what would become many, early hardcover editions of Ellery Queen’s mysteries. I put reading Jim Steranko’s History of Comics on hold, and immediately delved into the the Queen novel. The novel centers on a wild west rodeo performed in New York City. The performers are washed up cowboys and Indian fighters; some have appeared in silent western movies. They all have guns, which they shoot during the show. The victim even owned a pair of custom made revolvers. This book goes deep into the American gun culture, the culture born in the wanton destruction of native peoples, western wildlife, and the culture of racial oppression. Like much of American life, that culture is the backdrop, the stage scenery. The main characters deal with the violence wrought by a capitalism with no safety nets. The lead characters all came from rough beginnings, but have made it big in movies and rodeos, and have brought their show to New York City, performing shooting, roping and riding tricks, along with murder, in front of 20,000 screaming fans. Buck Horne is an aging cowboy, a popular movie star until the introduction of sound, much like William S. Hart, and so many others. The rest of the cast consists of orphans, brawlers, bawlers, bastards, boxers and imbibers, with money, with no money, and deeply in debt. The most telling line of this 1933 novel is the punch line. In order to deflect an important question, Ellery seemingly changes the subject by saying, “What did you think of the new Nobel award for literature?” When this novel was published, the most recent Nobel Prize for Literature (1932) went to John Galsworthy for The Forsyte Saga, a serialized soap opera about a family of “new money.” The cousins may have also been comparing that saga with the characters at the center of The American Gun Mystery. Of course, when I read the book in my summer camp cabin all those years ago, none of this occurred to me. It was, and still is, a well–written, gripping read, what the New York Times called “A Humdinger.” Way back then, rifle ranges were as common at summer camps as swimming areas. We learned how to handle guns, and how to aim for that small paper target far down the range. I even got good enough to earn the NRA Sharpshooter certificate. My son’s summer camp does not have a rifle range. It is not missed. About a month ago, he and I went to the Montreal Comic-Con. People dress up for comic conventions, wearing the costumes of action, fantasy and science fiction movies, video games, tv shows, books and comics. Many of these characters bear arms: swords, lasers, guns, and such. They are discreetly told upon entry to go to the weapons check section, to have their weapons verified as fake. A label is placed on the bearer’s show badge, and weapons can be inspected at any time. So, one kid I saw had a seriously creepy staring-into-space expression on his face, walking around holding a revolver, muzzle up, nearly to his chin. While he was in clear violation of the weapons policy, everyone basically ignored him. He was noticed, as I noticed him, but not reported to the convention authorities. Yet, one does wonder: was he practicing, or was he getting something out of his system? In the United States, we do not want to know. I understand, for instance, that the New York Comic Con has much stricter rules. We all know why; but I wonder how zero-tolerance of fantasy weapons moves us forward through our fears. My son’s summer camp has now, because of school dress-codes, changed the mascot: it had been a pioneer walking in the forest, rifle in hand. Now the pioneer holds a walking stick. A minor thing, to be sure. The change was done well. I am not opposed to it. The question always comes back: what are we fearing? Here’s a problem in deduction aimed at the reader: enough of the red herrings. What is the real solution to the American gun mystery? Is the solution to this mystery as far fetched as reviewers have often claimed? Almost ever review of this book on the internet complains about this. I found it no more far-fetched than other solutions to mysteries of the 1930s. Having finished this a few works ago I must say it has many of the same flaws as the first Lane book. Really far fetched. In fact in this case a important clue is withheld from the reader Not as good as some of the other early books. My first Ellery “Golden Age” mystery, read along with “Cat of Many Tails” and “The Scarlet Letters” in my own “golden summer” of 1967. I’d grown up with TV Westerns, and so this sang with me. It features good examples of what John Dickson Carr called not hiding your clues: Don’t throw them like a bomb and run, explore them and linger over them. The business about the pistol grips, for instance. Despite any far-fetched qualities, the story is colorful and fast-moving, and the denouement (as long as you accept the premises) is a thunderbolt.